within their own unique web-page. Also listed in our modelling Directory! with Models, Artists and Photographers. Art class at Creek Creative. Tutor : Location : Creek Creative. Faversham. Kent. My name is Michael Foreman. I am an artist and teacher . I studied Fine Art to degree level and then completed my teacher training in London on a "school centred initial teacher training" scheme based within inner city Art specialist colleges. I have worked in many different areas, using Art and Art therapy as a means of engaging young people and adults. Initially I worked in children's homes and found many young people who were disengaged and had no educational provision. I then helped to set up an independent school to provide for these children. I moved into secondary mainstream school teaching as a supply teacher, then as an English teacher and finally took up a post as a full-time Art teacher, where I stayed for 10yrs. More recently I left the mainstream school system to focus on adult education Art classes and have set up another independent school to provide for young people that have been excluded from school. My own work has always been about exploring different mediums. At University I switched from painting to sculpture and eventually created installation spaces (using sculpture, sound, lighting and projection) . After that I painted, mainly acrylic on canvas. Whilst teaching I developed an interest in photography and drawing and tried to combine these disciplines. I set up GCSE and A level Photography (lens based media) courses and designed and built a large darkroom facility. I draw regularly, either during my own classes or at home, and still enjoy painting and photography. I teach Life drawing at the Creek Creative Gallery in Faversham at least once a week, and have taught courses and workshops in Drawing Fundamentals, Painting and drawing and (kid's holiday) Art skills. We are planning some larger Life Drawing events for the warmer weather. All my classes are designed so that artists of any skill level can join in and contribute. My ethos is that we all benefit from sharing ideas, skills and techniques and that everyone can draw. My aim is to make Art more accessible to newcomers and to debunk the mythology that you need to be solitary, middle class and well-educated, in order to make "Art". Thank You & Best Regards. Michael. ANU is searching the UK to locate local venues suitable for life modelling. 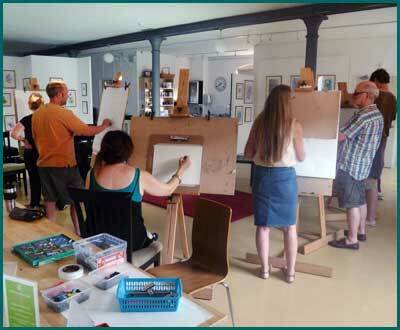 Announce and promote your life artist sessions, life workshops, art classes and tuition. We also offer basic student / apprentice entry-level membership.